Unaware of the marketing jobs in Hyderabad, many MBA graduates, even those with marketing specialisation, are losing out on good career opportunities in this lucrative field. Many companies in Hyderabad and Secunderabad offer good marketing jobs for freshers. In this article, we will discuss about different types of marketing roles available in most of the companies. Your first step in search for a marketing job should start with listing out all the companies which are headquartered at Hyderabad, as genuine marketing jobs mostly exist at company headquarters. In order to get a genuine marketing job, it does not make sense to look for non-Hyderabad headquartered (HQ) companies. Even if the company is smaller or lesser known, you will get a genuine marketing role that you deserve. Regional/branch offices do not have marketing jobs but provide more number of sales jobs. Many growing Hyderabad HQ companies especially look for MBA marketing graduates for all their non-sales marketing operations and to conduct national marketing campaigns. We can find a large number of HQ companies in Hyderabad/Secunderabad which are reputed and well established. So, there are plenty of career options from those companies. 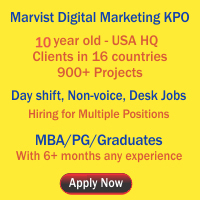 After shortlisting the Hyderabad HQ companies, look for the companies which offer the following marketing roles. As marketing is a part of every organisation you can easily find the below mentioned jobs in most of the companies. However, the number of positions open could be small as marketing positions are not hired in volume. Brand management/Product marketing management: Brand management plays a vital role in all the companies which have branded products. People working in this department define creative marketing strategies in order to establish a favourable, positive image for a company’s product in the public. They often support the company in differentiating its products from those of the competition. Though the process is previously called as ‘Brand Management’, now it is called as ‘Product Marketing Management’. The typical functions of this team involve in-depth customer analysis to determine the demand of the company’s products/ services in the market. Review and analyse sales reports of the product in order to determine the future development and business opportunities, collaborate with other departments of the organisation like product development, market research, advertising, public relations and sales to ensure maximum revenue, profitability and customer loyalty. They also ensure the product matches the needs of the customer and evolves overtime into more superior product for which customers are willing to pay a superior price. Promotion management: Promotion of a company’s products/services is a critical part of every organisation. Unless a company promotes its products/services, no one knows about them. Hence, creating a job in promotion management is essential for many companies. This job is commonly called as MarCom (Marketing Communications) job. Conducting various promotional activities like campaigns, advertising using variety of media like television, radio, Internet, etc., are a part of promotion management. The role of a MarCom professional involves designing advertising and promotional concepts, planning advertising campaigns, etc. Although artistic abilities are not required creativity, critical-thinking and problem solving skills are must to work in this position. A person must analyse the results of a promotional program to ensure it is working. Other roles open in this department are media planners, strategists, interactive designers, copywriters, etc. Market research: Many companies conduct market research in order to better understand the changing trends in the industry, to study customers’ purchasing behaviour, competitors’ market share, their company’s position in the market, etc. These kinds of market studies, intelligence metrics, and industry newsletters help them to make investment and on-going business decisions. So, in order to carry out such research operations, companies look out for people with close eye for detail, with strong analytical and communication skills, familiar with Internet, and those who can work independently. Roles available in this department are market research analysts, research supervisors, market research managers, etc. Typically much of the research work is outsourced to an agency as for most companies this work is not continuous. If company has many products and is marketing oriented then they may keep a marketing manager position in the company but use an outside market research agency for handling the work. Public relation management: The main function of public relations department is to help the company in cultivating favourable relations for their products with the public using variety of communication channels/tools. They build good contact with social and traditional media and try to create favourable image to the company’s product/service with creative publicity. Jobs open in this department are public relation manager, event manager, etc. There are also many PR agencies that offer jobs to service their clients’ public relation management. Internet/web marketing: With the growth of e-commerce industry, the demand for Internet marketing is increasing tremendously. Many companies have an in-house Internet marketing team which coordinates various web based marketing practices like online advertising, web marketing, e-mail marketing, etc., to drive direct sales. More specialized roles are also available in these companies like SEO specialists, PPC specialists, copywriters, e-commerce analysts, etc. Web/graphic designing: Web designing is a part of online marketing. Not only for e-commerce businesses, it is essential even for retail businesses since the online presence is becoming essential to attract the tech-savvy generation. A company having regular product updates, changes to website, or lot of marketing campaigns using brochures, pamphlets, e-mails also needs an in-house graphic/web designer. Web designers should be creative, design sites based on the marketing strategy of the business. Freshers with artistic and creative skills also get hired in these positions. Web designing is a continuous requirement for every e-commerce/retail business website, thus it offers better job security than other jobs like animation. Retail merchandizing: Retail merchandizing is a vital part of every retail outlet, which helps in attracting customers to the store. Retail merchandizing refers to various activities which contribute to the increased sale of the products. Responsibilities include stocking product, setting product to planogram, keeping the product area clean and organized and pulling damaged products off the sales floor. The display arrangements of the merchandize play an important role not only in attracting the customers into store but also in encouraging the purchases. It can be safely said that a few operations are mostly in-house for any company of decent size – like marketing managers, graphic designers, copywriters, and public relations. Unlike sales jobs, marketing has different job roles but only few positions are available at every company. Though an MBA (Marketing) fresher need to start his career at entry level – by performing well, and with proven success and experience, he can be promoted to the higher level overtime based on experience and results delivered. This entry was posted on Jul 2012 at 2:54 PM	and is filed under Marketing Jobs in Hyderabad > MBA Marketing Jobs > SEO Jobs. You can follow any responses to this entry through the RSS 2.0 feed. Your Feedback Matters!